I've liked taro for a long time. I've known it mostly in the form of bubble tea, but there are also taro puddings, and taro cooked in a savory way (like taro chips!). It's similar to a purple potato--it's a tuber, a root vegetable. It's often paired with coconut in desserts. Joe loves taro. When we get bubble tea, that's his go-to drink. For me, I usually go for lavender or jasmine, something a bit more tea-based. But when I'm introducing a friend to bubble tea for the first time, I usually tell them to order taro, it's the safest bet, and I've yet to find someone who dislikes it. It tastes like a very mild coconut, almost a floral-y coconut, mixed with fresh vanilla. It's hard to describe but it's so smooth and in a wonderful shade of natural purple. My friend Kaylen says it sort of smells like buttered popcorn, like of the jellybean flavor variety! Go figure. *StL peeps, try the taro bubble tea from St Louis Bubble Tea in the loop! Best taro tea I've ever had. My blogger friend, Shannon, over at A Periodic Table, came up with an interesting idea. She asks several bloggers one question every so often, and posts all the responses on her site. My answer is included! I discovered a bunch more blogs along the way and it's a wonderful way to get to know the other bloggers out there a bit more intimately. It got me thinking a lot more about blogging and why I do it. Shannon also posted a link to this post by Turntable Kitchen about blogging for comments, one that I wholeheartedly agree with. I've read so many awesome blogs that I never comment on, yet I often hope for comments on my own posts. Her post rings true for me and so many others. I finally ordered taro powder online, and after many sessions of glorious homemade bubble tea, I was ready to experiment some more with it. 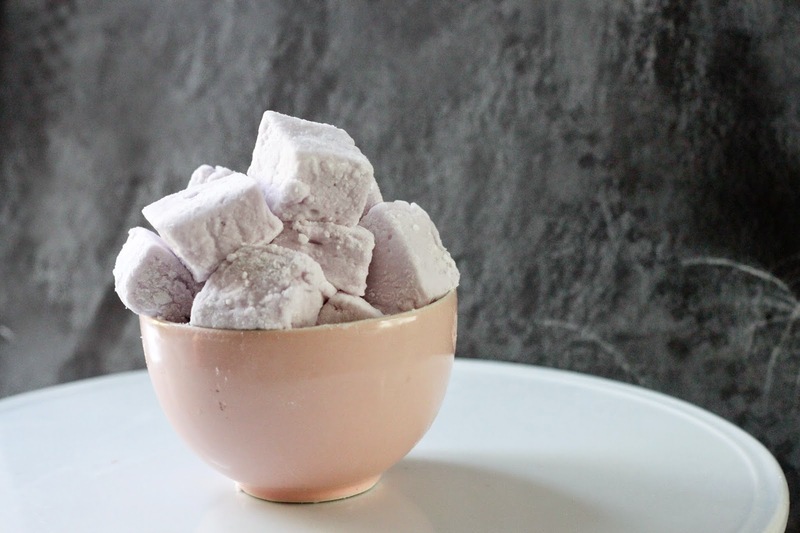 I haven't made marshmallows in ages, but they're such a great winter treat. Drop them into warm things for an added sweetness, or make s'mores with 'em. 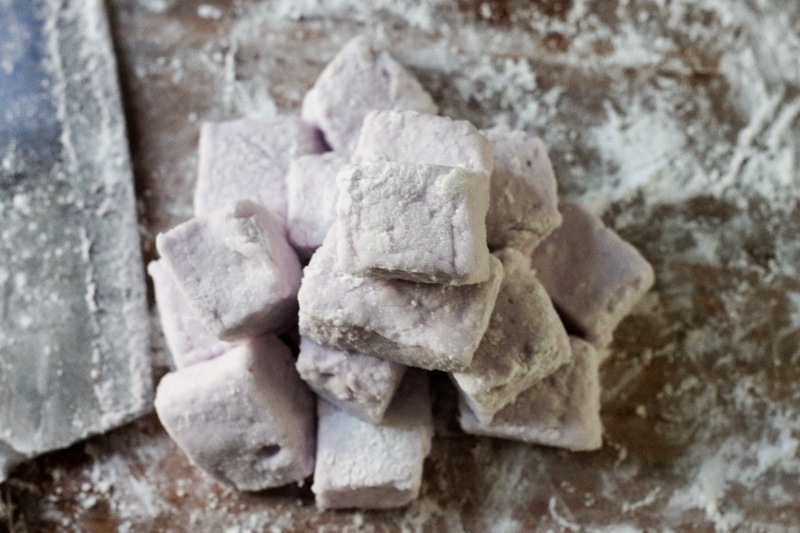 These marshmallows don't really work for rice krispy treats, however (my guilty pleasure). Mainly because they just melt into a soupy mess instead of a fantastic goop. Sad. 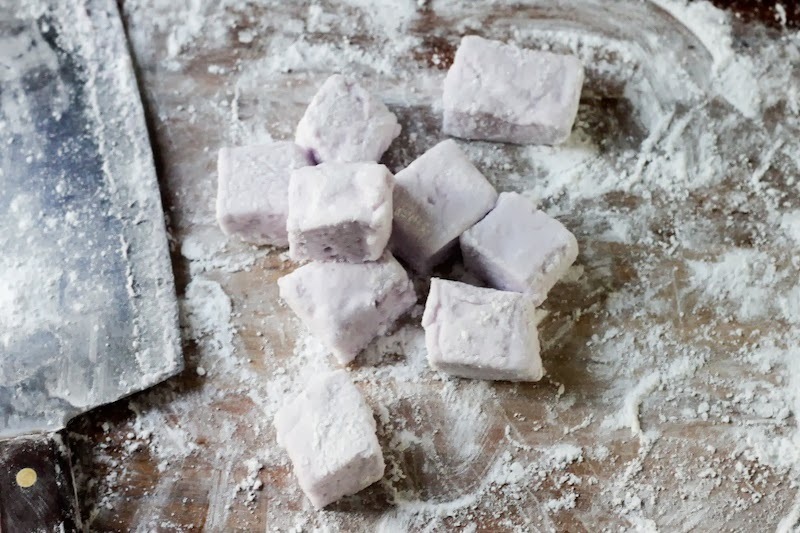 I came up with lots of ideas for what to do with these taro marshmallows but eventually, I just ate them all, day by day. They were amazing--fluffy and soft, imparting the most distinctive taro taste in every bite as they melted in your mouth. I was thinking, tropical s'mores--coconut crackers + white chocolate + taro marshmallows. Or perhaps just dipping the marshmallows in white chocolate? Or spreading them onto a blondie. If you have them long enough to make another dessert out of them, I'd love to hear variations. For now though, I'm just gonna scoot off and eat that last one. Pour the water in a microwaveable bowl and sprinkle the gelatin evenly on top. Set aside until the gelatin powder is immersed in the water. Stir together the sugar, corn syrup, water, and salt in a saucepan over high heat. Use a candy thermometer and boil until it reaches 238 degrees F.
While it's boiling, warm the bowl with the gelatin and water for about 30 seconds in a microwave, and then vigorously stir until properly melted. Add in the taro powder and stir until the powder is melted (you might need to zap it one more time to warm it up enough). 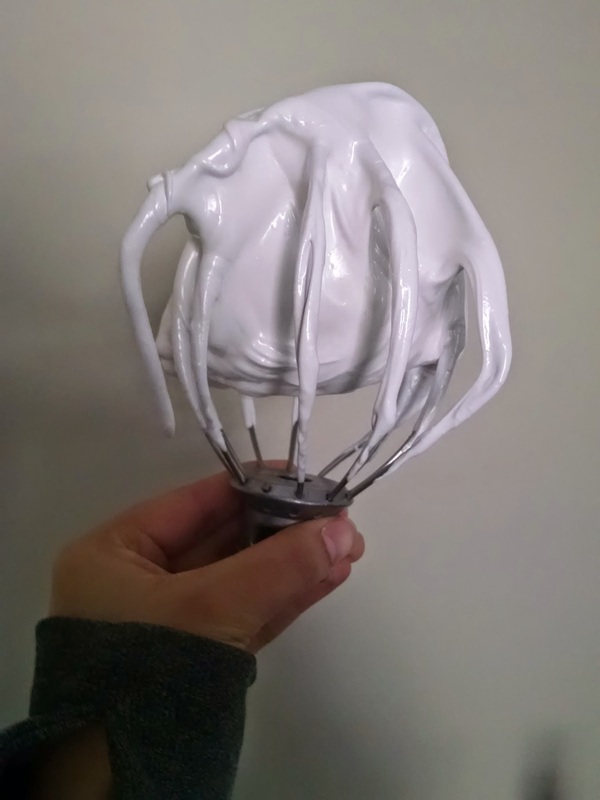 Add the mixture to a stand mixer and start running on low. When the syrup reaches the correct temperature, slowly pour it into the mixer bowl while it's running. Then beat on high for a couple of minutes until fluffy and white and tripled in volume. 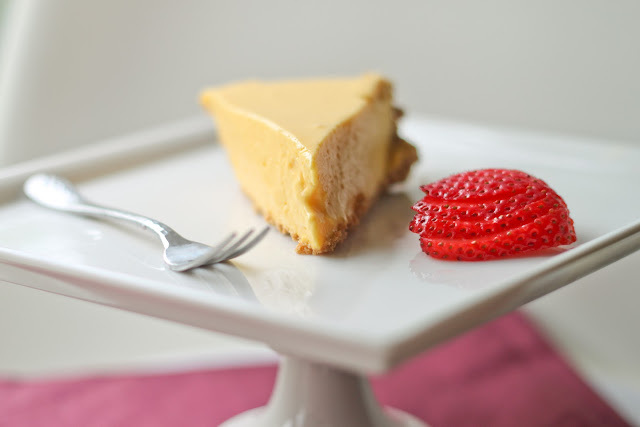 Pour into prepared pan, using an offset spatula to smooth out the top and smooth into corners. Sift the powdered sugar/potato starch coating evenly and generously over the top. Let sit for about 6 hours (usually overnight) in a cool, dry place. Invert onto a cutting board that is covered in the powdered sugar/potato starch mix and cut into whatever sizes you wish (use a cookie cutter for funsies). Dip the sticky edges into more coating. Store in a container with lots of the powdered sugar and potato starch mixture, it tends to get sticky over time. Consume in about a week or two. your description of a tropical marshmallow with this taro marshmallow, coconut crackers, and white chocolate is making my water mouth....these look so pretty! I'm excited to try taro! I feel like based on your description i would really enjoy it, so i can't wait to get my hands on some. Until then, i have a new reason to go grab some bubble tea; i've never had the taro kind, but i will next time i go. I love the taro bubble tea at St Louis Bubble tea! When I ordered it for the first time they told me it tasted like a "vanilla potato" lol I'll have to give these marshmallows a try, thanks! This sounds awesome! I love taro! My fav ice cream! I've still never had it in ice cream form, but it's so milky I think it'd be perfect!